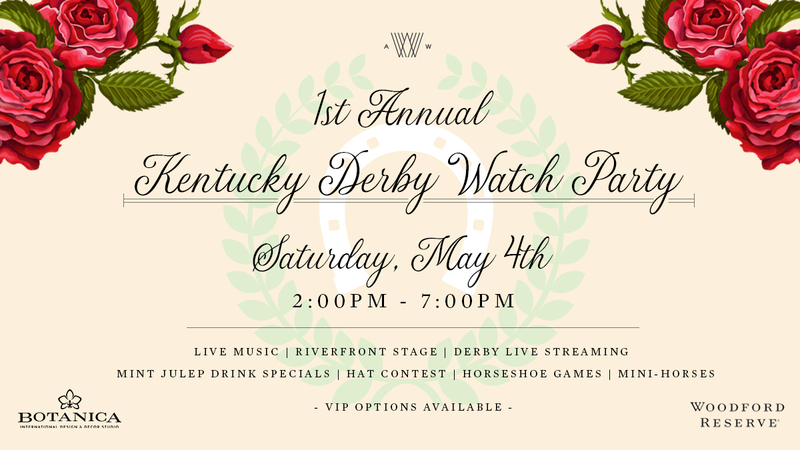 Woodford Reserve presents the first annual Kentucky Derby Watch Party at Armature Works. Join us May 4th from 2:00pm – 7:00pm, on the Armature Works Front Lawn, for a full day of festivities. Botanica Florist will transform the Armature Works Front Lawn into a Kentucky Derby soiree that includes live music all afternoon on the Woodford Reserve riverfront stage. We’ll have two 20ft LED screens live streaming the races, Mint Julep drink specials, horseshoe games, a hat contest, mini horses, and more. The event is free and open to the public. VIP tickets are available and can be purchased here. We hope you’ll join us for the most exciting two minutes in sports and what is sure to become a wonderful new tradition.